There are reports that the NFL is monitoring Arizona's SB 1062, which gives private businesses the right to refuse service to anyone if providing service would violate their religious beliefs. Phoenix is scheduled to host next year's Super Bowl, but the league stated that such a bill would be inconsistent with the league's (stated and purported) policies of tolerance, inclusiveness, and non-discrimination for all sorts of reasons, including sexual orientation. The fear among Arizona business and political leaders now is that the NFL may move the game if this bill becomes law (it has passed both houses and is waiting the governor's signature). And there is precedent for this--the league moved the 1993 Super Bowl from Arizona (theme warning!) when it failed to recognize Martin Luther King Day as a state holiday. But isn't this corporate speech? Isn't the NFL, a powerful entity, engaging in First Amendment expressive activities by using its economic influence to affect public policy? Isn't this exactly what critics of the "corporations have First Amendment rights" meme object to? (The NFL is not a corporation but an unincorporated association of associations, but I doubt that matters much for most arguments). Liberals and progressives and supporters of LGBT rights--the very groups most likely to be criticsl of Citizens United, are now quite pleased with, and supportive of, the NFL's stance and the (hoped-for) effect it could have on this horrific piece of public policy. But other than the valence of the political position at issue, how is this different than a large company trying to affect environmental policy or elections (which, in turn, will define policy)? This gets at what I always have regarded as an inconsistency in many anti-corporate-speech arguments. We like businesses that are socially conscious and that work towards the public good. But that must mean they have the same right to define (what they regard as) the public good as anyone else. It cannot simply be that entity speech is ok when it promotes LGBT rights, but not ok when it promotes something we do not support. ﻿Update:﻿ Gov. Jan Brewer vetoed the bill. I have a new Sports Illustrated piece tonight on Raymond Felton - good news for him. Major League Baseball today announced an experimental rule banning, or at least limiting, home-plate collisions. The rule change is designed to protect players, as collisions are a common cause of concussions and other injuries to catchers. Whether it does or not provides an interesting exercise in statutory interpretation. The rule reportedly reflects a compromise between MLB, which had wanted a must-slide-can't-block rule that would have eliminated all collisions and thus done the most for player safety, and the MLBPA, which did not want to make such a major change so close to the season, fearing the players would not have time to adjust. The basic rule prohibits a runner from deviating from the direct path home to initiate contact with the catcher (or whoever is covering the plate)--that is, from going out of his way to make contact rather than running directly for the plate. But the rule does not prohibit collisions where the catcher blocks the plate while holding the ball or trying to field a throw and the runner runs directly into him in trying to score. So, reading only the text, it is not clear the new rule eliminates most collisions, since most collisions come when runner, catcher, and ball all converge at the plate and running through the catcher is the most direct route to scoring. It thus is not clear that it provides the safety benefits it is intended to provide. The solution may come in the interpretive comments. An umpire may find that the runner deviated if the runner fails to make an effort to touch the plate, lowers his shoulder, or pushes with his hands, elbows, or arms. On the other hand, a runner does not violate the rule if he slides into the plate in an "appropriate manner," meaning his body hits the ground before making contact with the catcher. The upshot of the comments is to grant the umpires discretion to judge when the runner has "deviated" from the path. It incentivizes runners to slide in most cases, since a proper slide per se will not violate the rule, while running through the catcher might be deemed deviating, depending on how the umpire views the play (whether the runner lowered his shoulder or raiseed his arms, etc.). The rule seems unnecessarily complicated, given the player-safety goals involved and the fact that they simply could have modeled the rule after the rules that apply at the other three bases. But the sense seems to be that this is experimental, designed as a first step to get players used to this new way of playing. This is the sixth and final installment in a series of posts discussing my research into the history of the 1922 U.S. Supreme Court case of Federal Baseball Club of Baltimore v. National League, culminating in my recently released book, Baseball on Trial: The Origin of Baseball's Antitrust Exemption. Click here to read the earlier posts in the series. Because both the Court of Appeals for the District of Columbia and the U.S. Supreme Court issued published decisions in the Federal Baseball case, most sports law enthusiasts are well aware of how Baltimore's suit against the major leagues ultimately fared on appeal. Nevertheless, I was able to discover several interesting details about both proceedings during the course of my research. For example, the court of appeals held its oral argument in Baltimore's case less than three weeks after the news that the 1919 World Series had been fixed became public. 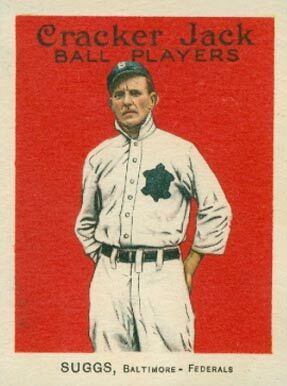 The impact that the Black Sox scandal would have on the appellate court's decision in the case was undoubtedly a concern for the major leagues. 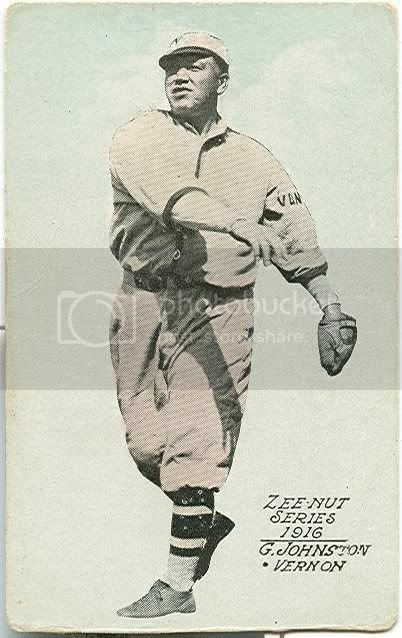 Indeed, some suspected that the court of appeals would conclude that baseball was subject to the Sherman Act because the scandal revealed the need for greater regulation of the sport. On the other hand, it is also possible that the court may have been willing to allow the American and National Leagues greater leeway to collectively centralize their operations in order to impose the type of discipline and authority that the scandal necessitated. Thus, it is ultimately unclear what impact, if any, the Black Sox scandal had on the appellate court's decision in the case. The court of appeals eventually reversed the trial court and held that professional baseball did not constitute interstate commerce. In particular, the circuit court characterized the major leagues as being engaged in "sport" not "commerce," while stating that Baltimore's case primarily focused on the reserve clause. This latter portion of the opinion has caused some subsequent courts and commentators to believe that the suit only involved allegations concerning the reserve clause, when in reality Baltimore's claims were broader. Nevertheless, the Supreme Court ultimately affirmed the court of appeals' decision in 1922. Although the Supreme Court's decision has always been understood to be unanimous, my research revealed that at least two justices -- Brandeis and McKenna -- initially cast dissenting votes. 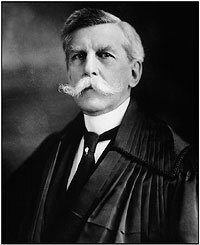 Indeed, both justices eventually wrote to Justice Oliver Wendell Holmes, Jr. (pictured), the author of the majority opinion, to report that they were switching their votes so that the decision could be unanimous. Justice Holmes's opinion in the case has regularly been misinterpreted, with many believing that it simply held that professional baseball was not sufficiently interstate in nature to fall within the Sherman Act. In reality, Holmes' decision was premised on two separate grounds. Most fundamentally, he determined that baseball was not commerce, adopting the major leagues' characterization of the term as being limited to the production or sale of tangible goods. In particular, Holmes stated that "the exhibition, although made for money would not be called trade or commerce in the commonly accepted use of those words." 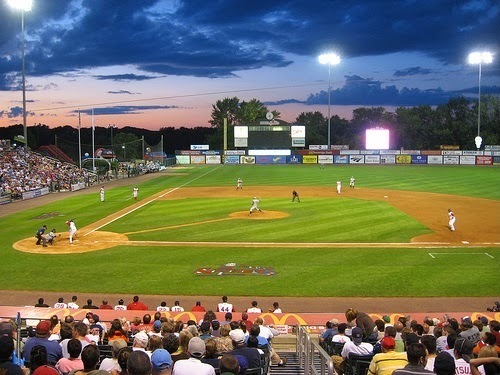 In addition, Holmes also determined that professional baseball was not interstate in nature because the entire source of the industry's revenue -- i.e., ticket sales to baseball exhibitions -- was generated within a single state. The transportation of players across state lines, he concluded, was thus merely "incidental." While subsequent commentators have been highly critical of Holmes' decision in the case, my research revealed that both parts of his holding were consistent with the legal precedents in place at the time. Moreover, neither of these arguments was ever effectively rebutted by Baltimore's counsel in its briefing. 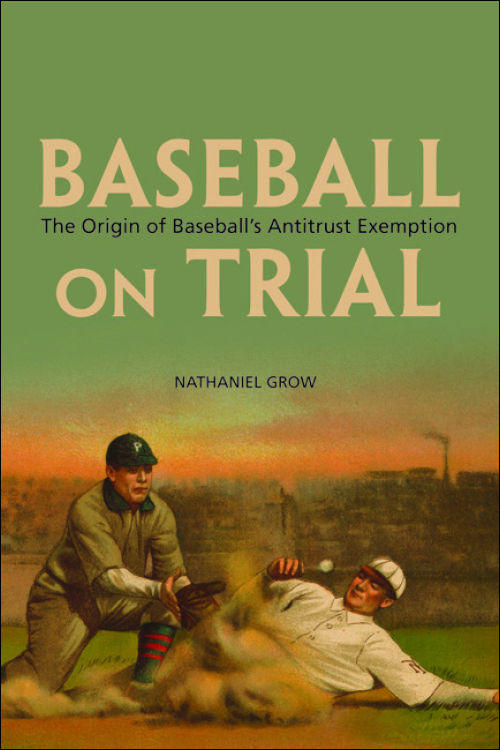 Therefore, my book ultimately concludes that the Federal Baseball case, although heavily criticized today, was in fact correctly decided given the applicable legal precedents in place in 1922. 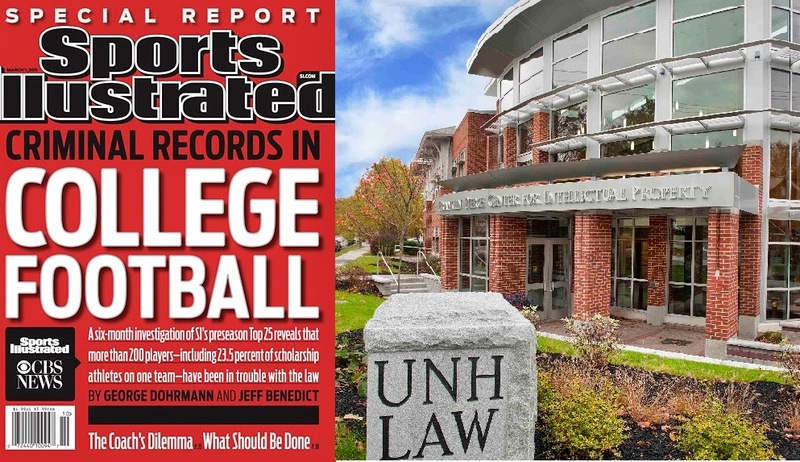 We've previously blogged about the Great Lakes Sports and Entertainment Law Academy, a summer program run by Peter Carfagna and Craig Nard and affiliated with Case Western and Cleveland-Marshall Law Schools for law students interested in sports and entertainment law. 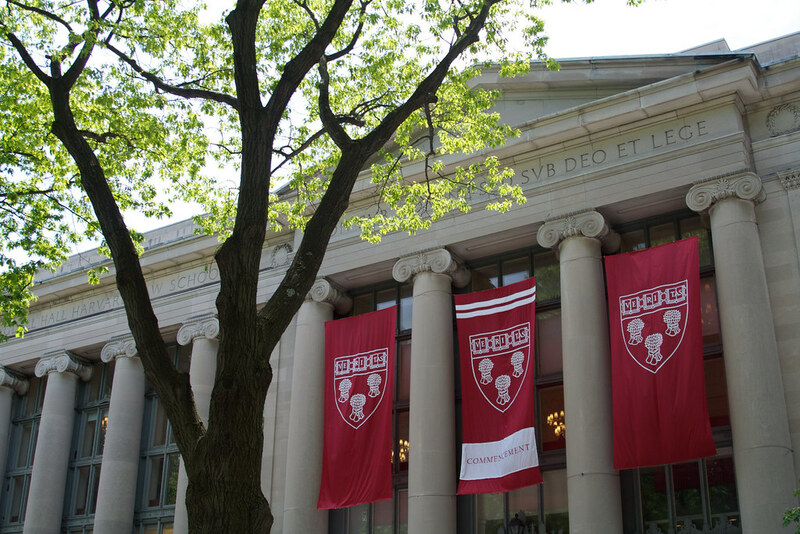 The academy, which offers distance learning, has a great deal to offer and will have courses this year from May 18 to June 7. For more information, click here. The controversy surrounding Richard Sherman’s interview with Erin Andrews and Marcus Smart’s suspension for interacting with a fan, harkened me back to my first year Torts class. While studying the distinction between negligence and recklessness, our reading assignment included the 1977 case Hackbart v. Cincinnati Bengals, Inc. and Charles “Booby” Clark, 435 F. Supp. 352 (1977). The facts recounted how on an interception during an NFL game, Clark, a running back with the Bengals, elbowed Hackbart, a defensive back for the Broncos, in the back of the head, thereby shortening Hackbart’s career. The pre-game psychological preparation should be designed to generate an emotion the equivalent to that which would be experienced by a father whose family had been endangered by another driver who had attempted to force the family car off the edge of a mountain road. The precise pitch of motivation for the players at the beginning of the game should be the feeling of that father when, after overtaking and stopping the offending vehicle, he is about to open the door to take revenge upon the person of the other driver. While Hackbart was a civil case regarding liability, the underlying premise remains that high level athletics (the National Football League, Big 12 basketball) is equal parts emotion and physicality. Thus, when Richard Sherman did his best Clubber Lang impersonation with Erin Andrews, it was just a natural outflow of the “controlled rage” that most in the NFL live on in order to play a sport that is the equivalent of being in an automobile accident on every play. What Richard Sherman says 30 seconds after a game has to be placed in different context to what he says one hour after a game. Fast forward to Oklahoma State’s Marcus Smart, who was suspended Sunday by the Big 12 for “inappropriate conduct with a spectator” toward the end of their game with Texas Tech. The Big 12 must have a pretty loose definition of the term “spectator.” Much to the mortification of many basketball purists, high level collegiate basketball has become a contact sport, and no matter how often the officiating higher-ups produce “points of emphasis” (see this season’s cause celeb – the hand check), the game will continue in a rectilinear direction towards increasing contact. 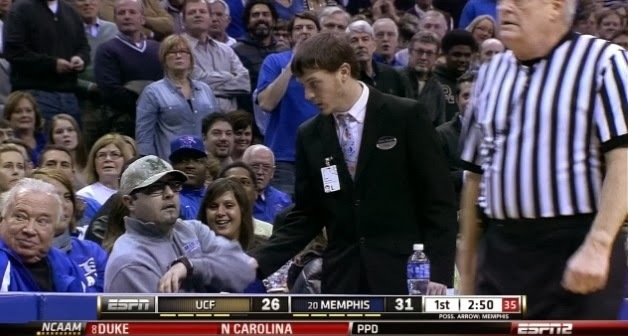 As Marcus Smart tripped over a camera operator, he ended up a few feet from Tech “super-fan” Jeff Orr. In a two point game with just a few seconds left, Smart had just finished sprinting down court in an attempt to block a Tech layup. He was called for a foul. At this point, Marcus Smart’s mental state was probably not much different from that of Richard Sherman’s after Sherman deflected the game winning pass intended for Michael Crabtree. While I don’t condone Marcus Smart verbally engaging Jeff Orr, I don’t think the three game suspension was warranted. A close inspection of the video shows that Orr made a quick upward gesture with his left hand in very close proximity to Smart’s face. An argument could be made that Jeff Orr’s hand feign constituted an assault placing Smart in apprehension of imminent harm and his push of Orr was self defense. Is it unrealistic to think that at that split second in time, Marcus Smart’s conduct was an outlier, even if he wasn’t 19 years old? Unfortunately, it appears Smart’s discipline neglected to factor in “controlled rage” which major college and professional athletics regularly and handsomely cash in on.